Brenda Millson, the grandmother of a 13-year-old mentally unstable boy was shocked to receive 3 letters from neighbours in Newcastle, Ontario, Canada complaining of her grandson‘s autism problem. In the typo-ridden letter, a particular mother who claims she lives in the neighbourhood told the grandma to vacate with her autistic son or put him to death. After receiving different anonymous threats, Brenda immediately reported the case to the police. After investigations, police concludes that the letters are not hate crime. The autistic boy named Maxwell Begley who currently lives with his brother and parents in Oshawa, Ontario spends most of his summer days at his grandmother’s house in Newcastle. Brenda Millson said the shocking letters suggest she is the mother of the mentally unstable child. Karla Begley, the biological mother of 13-year-old Maxwell is currently suffering from multiple sclerosis and confined to a wheelchair. She claims her son will stay with his grandmother in Newcastle, Ontario until his summer vacation is over despite the threats. “It was a threat, it’s disgusting, they wanted her to leave and move, like we are not allowed to be around ‘normal society,” Karla Begley told CP24 of the letter to her mother. He is a hindrance to everyone and will always be that way!!!!! Who the hell is going to care for him?????? No employer will hire him, no normal girl is going to marry/love him and you are not going to live forever!! Personally, they should take whatever non retarded body parts he possesses and donate it to science. What the hell else good is he to anyone!!! 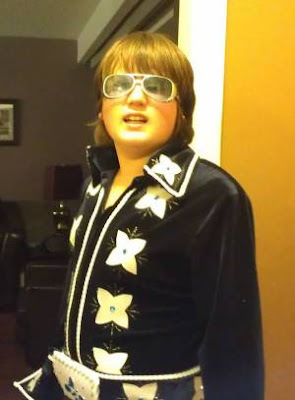 You had a retarded kid, deal with it… properly!!!!! What right do you have to do this to hard working people!!!!!!! 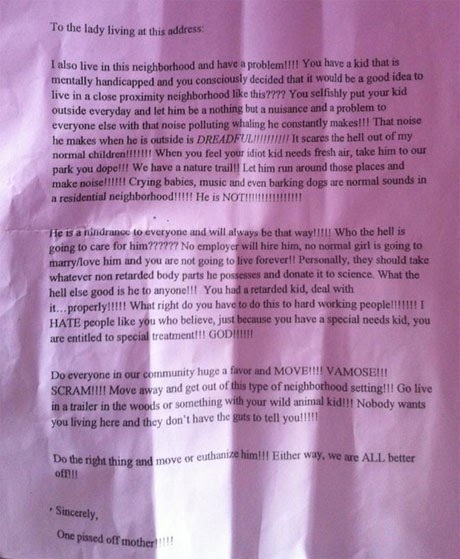 I HATE people like you who believe, just because you have a special needs kid, you are entitled to special treatmen!!! GOD!!!!!!! Do everyone in our community a huge favor and MOVE!!!! VAMOSE!!! SCRAM!!!! Move away and get out of this type of neighborhood setting!!! Go live in a trailer in the woods or something with your wild animal kid!!! Nobody wants you living here and they don’t have the guts to tell you!!!!! Autism is a very serious condition that often affects neighbour and family involved due to the mental instability, autistic people often make irrational sounds or even annoying screams. But this should not warrant the above annoying letter. Angry Canadian family with kids suffering from autism have took to their Twitter pages to blast the anonymous woman who wrote the above letter. Support messages for Maxwell Begley have flooded Twitter since Friday. Government should do something about it, mean to protect life.